NEWTON — Always do your best and don’t give up. That's a lesson Newton Elementary School teacher Cindy Strickland hopes to teach her students – by example. "Although I haven’t been at school a lot this year for personal reasons, I want them to remember I still support them, and want them to do their best," Strickland said, adding that she makes sure her students are on level – where they are supposed to be. "I keep in contact with the assistant, even grading papers at home, so I will know their academic status." For her dedication to her students, Strickland was recognized as the Golden Apple teacher for September during a ceremony at the school Tuesday. The first-grade teacher has taught at Newton Elementary for five years and credits her peers for her success. "I had some good teachers in my high school, but I have had more experience here that has pushed me to be who I am," Strickland said. "Gina Gordon, also a Golden Apple winner, has been through as much as I have. I watch her daily with a smile on her face, being so positive. That is partly why I’m who I am because if she can do it, I can do it. There’s not a struggle that can keep us behind." Strickland has been out of the classroom recently, tending to her three-year-old son Bentley, who was born with Hurler Syndrome, a genetic disorder. She said Bentley keeps her faith strong, which translates into the classroom. "If I had a bad morning at home, the minute I see my students enter the classroom with a smile on their face, it is a complete relief," Strickland said. "They push me and that is why I am here. They brighten my day and I can’t wait to get back in the classroom." Strickland said she was suprised to get the Golden Apple award. "It’s something I never expected to get, and I sure didn’t expect to come here today and get it," Strickland said. "I’m not so sure I deserve it at all times, but I try my best to be the best person I can here, and at home too." Newton Municipal School District Superintendent Nola Bryant said the honor couldn’t have happened to a better person. "To hear a co-peer attest to her dedication and commitment, and to hear her principal talk about what a good job she does even in her absence – truly embodies what a strongly committed teacher is," Bryant said. "That’s what we need, teachers that are willing to go in and make a difference no matter what it takes." Newton Elementary Principal Kay Killens said Strickland puts others first – always. "Her ability to go through the responsibilities of Bentley’s care, with such grace, while providing her first-grade students a loving learning environment, and quality instruction, amazes us all," Killens said. First graders Devan Smith and Nevaeh Holloway said they were happy Strickland won the award. "I think it made her really happy to win this award," Smith said. "She is a very good teacher and teaches us everything we need to know to get to second grade." "When she teaches us things it is so exciting – it was good that she won," said Holloway. "I love watching them grow – becoming something I know they can be, that they think they can’t be," Strickland said about working with children. " A lot of times they don’t have the push or help at home. For me to be able to give that part of their life to them makes a big difference. First graders are impressionable – teaching them can sometimes be a struggle, but gifting too." 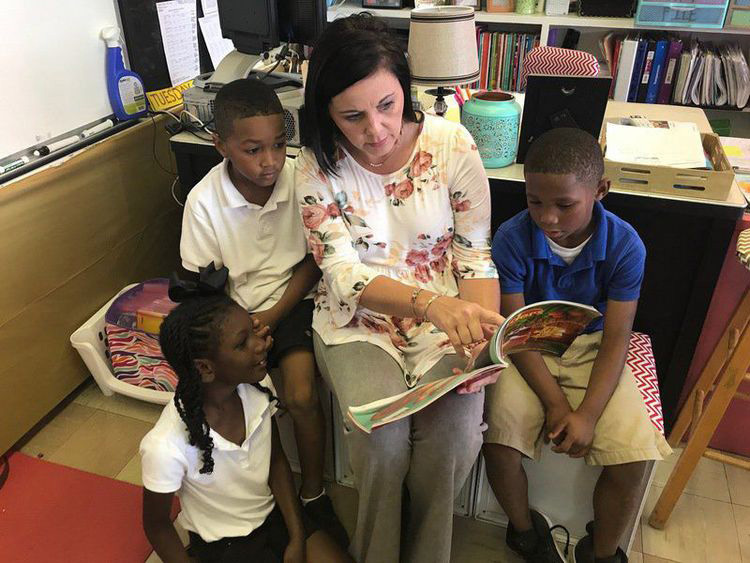 "It’s very rewarding when you see how excited a child is when at the end of the year they have learned to read," Strickland said. "When a child I have taught runs up to me and tells me they love me, and I am the best teacher ever – it makes my day complete." Outside of the classroom, Strickland loves to spend time with her family. "I love my family – it’s all about my kids," she said. "They are all I think about, the closeness and family involvement is very important to me. We love to ride horses – riding horses and family time is our big thing." Looking ahead, Strickland said winning the Golden Apple has motivated her to set an example, not just for her students, but for other teachers as well. "Just to know that I have people that look up to me, motivates me," Strickland said. "I want to be all that I can be and more. I don’t want them to ever doubt me. This group has been with me and been so supportive. It’s not just a workplace it’s my home, and I’m happy right where I am."